Everyone can experience the amazing feeling of seeing a tornado or a supercell, without being a professional meteorologist or an experienced storm chaser. In this blog post I will explain what your options are and how you can make it happen. I have personally chased storms with four different tour companies (five this summer). I have talked with most of the active tour companies while on the roads and follow the storm chasing community closely. I dare to say that there are very few, if any, who have the same experience about different storm chasing tour companies as I do. I am not an experienced storm chaser myself, but I am a very experienced storm chasing tour guest. First of all, as a complete amateur you should never chase storms by yourself. This is not what this blog post is about. It is just as possible to chase storms by yourself as it is to go to Florida and wrestle crocodiles Steve Irwin-style, but equally stupid. Supercells and tornadoes are dangerous. Do not think you can chase them by yourself without proper knowledge. Please. So, in order to experience severe weather safely you should go with someone who knows how to chase storms. For this you have two options: find a chase partner and convince him/her to take you along or go on an organized storm chasing tour. Finding a chase partner is quite difficult if you don’t have a good friend that you can tag along with. Typically, chasers tend to chase with other chasers in order to exchange expertise. However, many storm chasers chase by themselves which can be boring (during the transportation part) and expensive. If you pay your share for gas and do a fair share of driving you may be lucky someone will bring you along. Your best shot to find a chase partner is the annual storm chase partner forum thread at StormTrack.org. Chasing with an organized tour company allows you to experience storms without having to know anything, you can just “come along”. There are about 15 different tour companies operating. Each year, between April and July, they bring a few hundred tourists in total to the storms – which is, in fact, very few. 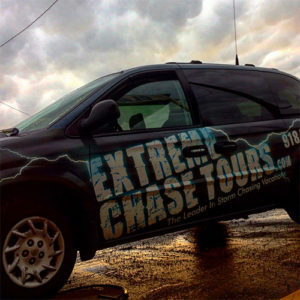 So, going with a storm chasing tour company is most likely your best option. I am not saying that because I run a website about storm chasing tour companies but because this is your only real option, and a good one as well. Going with an organized means, above all, you will be chasing with an experienced tour guide. He (almost all tour guides are male) will find the storms and position you so you can actually see them. This is nowhere near an easy task. An inexperienced chaser may get lucky but an experienced tour guide will bring you to the best storms on a regular basis. If you take one week vacation to chase storms, make sure you actually see them. The tour guide will keep you safe. An experienced tour guide knows what a storm can, and likely will, do. He knows where to position you in order to observe the storm safe from tornadoes, damaging winds, hail and lightning. He will keep track of escape routes and make difficult decisions for you. The tour guide will explain what happens. Even though storms and tornadoes are visually striking it is a lot more fun if you understand the mechanics of what is happening. If you know what is going on during each part of the event, the tour will be more exciting as well. In addition, understanding the mechanics of the storms allow you to appreciate days that may not have tornadoes (and you will have those days for sure). Another benefit of going on an organized tour is that you will also not have to bother with finding hotel rooms every night, which can be a hassle when you are in Nowhere, KS, at 10 a.m. while being tired from an entire day of chasing. 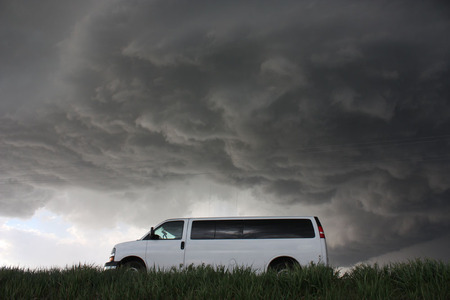 Most, if not all, storm chasing tour companies started from a passion of chasing storms rather as a business plan. Chasing storms is expensive and bringing people along can make you turn a bit of a profit instead, as well as meet new people. The result is that many tour companies are often “family styled”: small, friendly and you are likely to be chasing with the owner himself. The experience is often more of driving with a (new) friend rather than with a company. There is of course a range on how “family style” the tour companies are. All companies try keep it nice and friendly but some companies have grown into more of an organized business. There are advantages and disadvantages with each style. The benefit of small family style tour companies is that they are usually a bit cheaper, they bring less people and are more personal. They have no fixed rules or guidelines so the one tour could be different compared to the next depending on the tour owner. The benefit of the tour companies that fit more into the organized business category is that you are more likely to get more of a professional and reliable experience. Organized business tour companies have guidelines in how to perform each tour, like having morning meetings every day with an extensive debriefing, feedback forms etc. The organized business style of tour companies often chase with more than one van on each tour, i.e. have more guests. Of the tour companies I have tried myself PDS Storm tours and Extreme Chase Tours fall more into the “family style” category. Tempest tours fall into the Organized Business category and Cloud 9 tours I would say is somewhere in the middle. So, which tour company should you choose? I can, personally, only vouch for the ones I have chased with myself. They are all good, solid tour companies with highly skilled tour guides. I can recommend each of them, for different reasons. On StormChasingUSA.com I have put every tour company that is currently operating. Most of them have reviews and ratings that will help you with your decision. The tour companies themselves also explain why you should choose them and for what reasons. On StormChasingUSA.com you can search for tours according to price, date etc. as well. If you want the “organized business” tour experience your options are likely to be Tempest Tours, Silver Lining Tours or Extreme Tornado Tours. Most other would fall more or less into the “family style” category. Is it not dangerous to chase storms and tornadoes? Lastly, a question I get all of the time: is it dangerous to chase storms? Tornadoes are dangerous and several unfortunate people die and get their homes devastated by them every year. One major difference between living in Tornado Alley and chase storms is that when you chase storms you are informed and mobile. When you chase storms with a professional you have access to weather models, radar and the experienced eyes of the tour guide. You literally chase the storms yourself – they don’t chase you. The tour guide knows where to be, how to get there and how to get out of there. When you live in Tornado Alley, on the other hand, you are living your every day life when the storms appear. You are probably informed by the news reports if storms are likely or if there is a risk for tornadoes that particular day but you still need to go on with your daily life and rely on caution and tornado sirens. If a tornado approaches your town you may not know for sure until you hear the tornado sirens and then you have very little time to get into shelter – if you have any shelter at all. Thus, you are not as well informed or as mobile as a storm chaser. Still, there is a certain danger to chase storms. The dangers are, however, not likely to be the tornadoes but rather the vast amount of driving you will do. When it comes to the storms, the lightning is the most dangerous part because it is the least predictable weather phenomenon you will encounter around these storms. 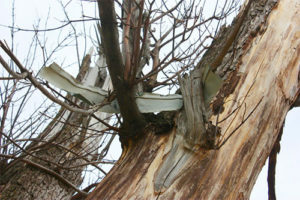 Please read up on more articles like this one on StormChasingUSA.com. If you have any questions, feel free to post them in the comment section below. Let me know if you have decided to go chasing!